Besan or Gram flour is a very popular ingredient used in making of various dishes in Indian cooking. Gram flour is a powder made by grinding Bengal gram or Chana dal and it has a nice nutty flavour. The besan is a chief condiment in Indian, Pakistani and Bangladeshi cuisines.Gram flour is yellow in colour, powdery and has an earthy flavour. It is used in making a variety of savoury and sweet dishes. This flour makes a tasty and crispy coating for make various deep fried vegetable pakoras. The variety of chickpea flour depends on the kind of chickpea used to ground. One can use either raw or roasted chickpeas. Roasted chickpea flour is more characterized; while raw flour has a slightly bitter taste. Also known as besan, it is used in gravies, batters, etc. When made into a paste with water or yogurt, it is used popularly as a face cleanser in the Indian subcontinent. Besan is also commonly used as a replacement for egg in vegetarian cooking. Chila, which is a very popular fast food and snack is made from gram flour batter. Gram flour contains high quantity of carbohydrate and no gluten. However, compared to other flours, gram flour is high in protein content. It is also quite popular in Italian and French cuisines. Besan or gram flour contains a high proportion of carbohydrates, however, compared to the standard wheat flour. Besan is also rich in various nutrients including magnesium copper, folate, and manganese. It also contains iron, zinc, phosphorus, calcium and potassium. Rajasthani Gatta Curry or Gatte ki subzi is a very popular Rajasthani vegetarian dish made from besan atta (Bengal flour or chickpea flour). Dumplings made from gram flour and dry spices are steamed and cooked in a spicy and tangy yoghurt based sauce. This dish tastes exceptionally good with any type of India flat bread like roti, chapatti, paratha, puri or bhakri or steamed rice. 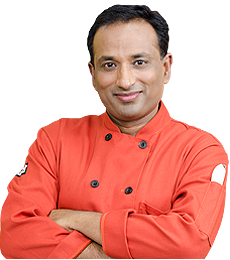 Paneer Besan Ka Cheela or gram flour combined with grated paneer and made into excellent savory pancakes. 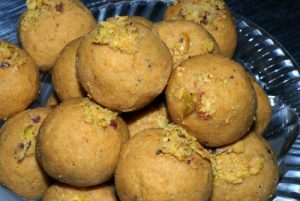 Besan Ladoo are rich, sweet dessert-snack made from gently roasted gram flour (besan) sweetene with sugar. Ladoos can be served any time of the day. Traditionally in Indian households ladoos and burfis are served as cookies and chocolate and specially prepared during festivals. Kothimbir Vadi Maharashtrian Snack A quintessential Maharashtrian savory snack recipe, kothimbir vadi or coriander(cilandro) cakes are basically a salty cake preparation with kothimbir( coriander leaves or cilantro). The kothimbir vadi is first steamed and then fried until crispy and served with tomato chutney or a tempering of mustard seeds and grated coconut. Zunka - Junka – Pitla is a popular dish from the North Karnataka and Maharashtra region popularly known as Pitla Bhakri or Pitla. Pitla is a quintessential Maharashtrian dish that can be made in less than 5 minutes for a quick fix as a main meal. It is made with Besan flour as the main ingredients and seasoned with cumin seeds, ajwain and other spices. Egg Pakora Bread discs topped with spicy potato mixture sprinkled with sesame seeds and deep fried till perfection.Chicken gold coin. it is a chinese style gold coin made with chicken. this yummy lip smacking gold coin waters your mouth and it is a perfect snack for a party. Boondi is a Indian snack made from Chickpea flour. It is a fried snack that can be prepared in two different flavors sweet and salty (khara). Generally added to mixture, or eaten by itself with some salt and chilli powder added or made into a yummy boondi ladoo. Punjabi Kadi Pakodi is a popular dish from the Punjabi cuisine where pakoras are made and cooked in tangy sour and spice yoghurt sauce thickened with besan flour. Patisa – Soan Papdi It is made from sugar, gram flour, flour, ghee, milk, and cardamom.Some people are of the opinion that Patisa and Soan Papdi are different things. Patisa is more hard and dark in color, Soan papdi is very soft like fibre or flakes.Soan papdi or soam papdi or sonpapri or sanpapdi or patisa is a popular South Asian ,India, Bangladesh, Pakistan, Nepal sweet. It is usually square in shape or served as flakes, and has a crisp and flaky texture.This sweet is commonly sold in streets which attracts kids a lot. The Origin place of sohan papdi is a small town called Najibabad of the district bijnor in the state of Uttar Pradesh. Bharwan Bhindi is a spicy delicious filling which is filled in the slit bhindis makes for a lovely side dish with roti or Paratha of choice. This recipe belongs to Rajasthan where besan and curd are used extensively in cooking. Muthia ke ladoo is an amazing Indian sweet dumpling from the Rajasthani cuisine made with ghee added to wheat flour, besan and semolina sweetened and made into small roundel shaped dumplings. Aloo Vadi - Steamed vegetable leaf roll is a steamed vegetable leaf roll recipe with the aloo or colocasia leaves rolled up one after another after getting smeared with a besan paste. These aloo patras are then cut into small spices and then steamed or deep fried as desired. Mysore Pak is a sweet dish from the south Indian cuisine, usually served as dessert. It is made of generous amounts of ghee (clarified butter), sugar and gram flour. Mix Vegetable Pakora is an easy to make Indian starter prepared with mixed vegetables, chickpea flour and carom seeds. Goes as evening snacks. Mirchi Vada Bajji or should we also call it Jodhpuri Mirchi Bada which is a very popular namkeen snack in the state of Rajasthan. The traditional Mirchi bada is made of the large variety of green peppers stuffed with a spicy potato mix, coated with gram flour and deep fried until slightly golden in colour. Chicken Pakoda – Masala Chicken Nuggets are yummy and delicious appetizers or snacks made with succulent chicken pieces and spices combined together and coated with a spicy batter deep fried to make exotic and exceptionally tasty pakodas. Bhendachi Kadi - Okra in Butter Milk Curry A simple kadi or khadi made with butter milk and fried okra. Bhindi Kurkuri - Crispy Okra made with finely sliced pieces of okra mixed to chickpeas flour and spices; deep fried until crispy. Hara Pakoda Thotakura balls made with Thotakura/ Amaranth leaves/ Chauli are much loved greens used for preparing stir fries, dal and stew in our daily meal. Thotakura balls is an amazing variation for preparing fritters with these green leaves added to chick pea flour (besan), spices and deep fried until crispy and golden in colour. They are easy to prepare, taste good with sweet chutney, has unique flavours and is best served for any cocktail party for vegetarians or is also a nutritious party appetizer or a tea time snack. Onion Pakodi is a mouth watering indian snack. It is used as a strater snack in most indian parties and large meals. It goes with imli chutney Onion Pakoda is a deep fried batter snack made of gram flour (besan), other spices and onions.Onion Pakoda is a deep fried batter snack made of gram flour (besan), other spices and onions. Unlike the potato bajji or the banana chilli bajji, the batter for the onion pakoda is different. Moolachi Kadi Moolachi kadi, radish grated, tempered and cooked until soft in a delicious, creamy and slightly spicy besan and yogurt mixture. Moolachi Kadi tastes extremely good with hot steamed rice. Do try these easy to prepare besan recipes as they are truly nutritious and healthy to eat.